Municipal and library workers in BC have found common cause – and have collaborated on a breakthrough campaign to mobilize their collective power at the bargaining table. After several rounds of bargaining with limited coordination, the union heard from members that they were looking for more in-depth planning. This prompted CUPE staff and leadership to roll once-distinct projects into one massive campaign to get ready as municipal and library contracts start expiring in December of this year. The South Coast Municipal and Library Campaign brings together 24 municipal and library locals, representing 22,000 members and covering a huge part of southwest BC, from Hope to Pemberton. The campaign builds upon the significant investments in member and community outreach by locals, and provides an opportunity to pool resources, share experiences and support one another. The campaign brings together community outreach, coordinated bargaining, internal organizing and local leadership training into one big effort. The idea to band locals together to host a cost-shared campaign to raise CUPE’s profile or to deal with a difficult situation wasn’t new. But members and staff realized that they needed to work together collaboratively to build trust between locals that have had differences in the past. Working together can be a challenge – but it always produces rewards. 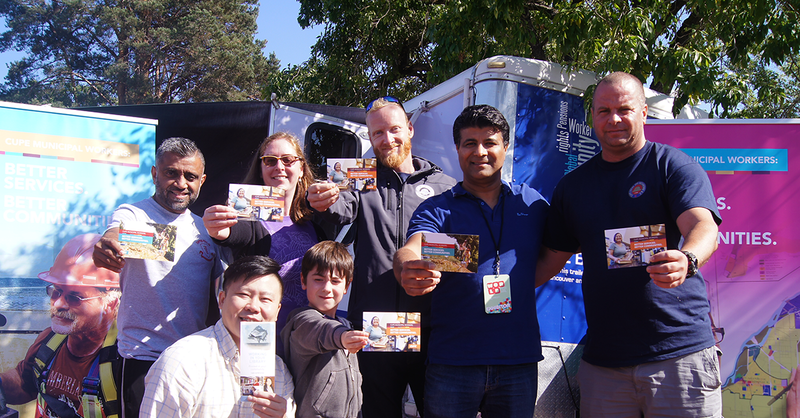 The campaign launched in August 2018 with the CUPE BC Trailer visiting local communities and supporting family-friendly events like BBQs. The union organized leadership meetings and educational opportunities and begun to build a plan to coordinate bargaining through 2019. The campaign also includes a digital component, including a pro-public services video as well as advertising materials. As the campaign progresses, we are providing opportunities for further local leadership training and creating research resources that will be used across the region to align locals on shared issues and bargaining goals. As municipal and library contracts start to expire across BC later this year, we’re busy building solidarity – and combining our strength. Bringing people together to make decisions about the campaign has fostered trust and communication between locals – and that has made our bargaining power even stronger.